Even when outdoors, storage is an essential need. You need space and accessories to store not just food but also other day-to-day essentials. 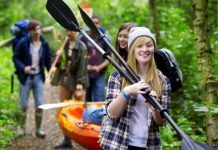 Proper camping storage organizers and containers can make life easier when having fun outdoors. 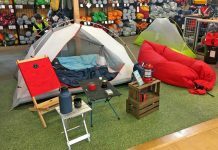 Take a look at some of the essential camping storage units and accessories that we think are a must have on a camping trip. A handy camping storage organizer, the Free Standing Organizer from Coleman, will easily fit in the corners of most tents. It does not occupy much space and with three shelve helps you organize quite a bit of your camping stuff. The free standing organizer can be used to store food, utensils, towels and other such items. 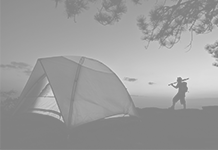 It is convenient to organize essentials like fuel, lantern and other camping gear that you may have. It has a double frame for stability and it is available in white-cyan combination. This handy camping storage is available for $10.99 on coleman.com. 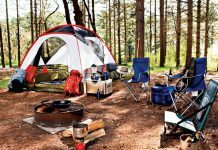 The Stansport Collapsible Campsite Cary All is a handy collapsible bin that can be used to store everything. 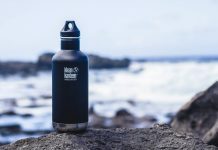 You may like to use it as a trash can to keep your campsite clean and free of debris. It is quite large as it stands 24” tall and is 19” in diameter. 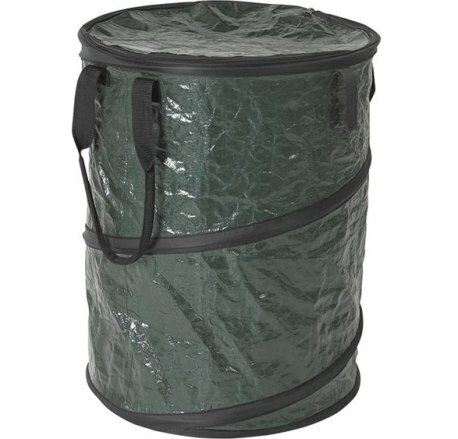 The Carry All camping storage is made from polyethylene material that is of heavy duty quality. The top is completely zippered to keep your stuff secure, or trash out of sight. It is easy to carry with two well padded web-strap handle and can be folded into a compact size when not in use. It is available on summitcampinggear.com for $22.95. 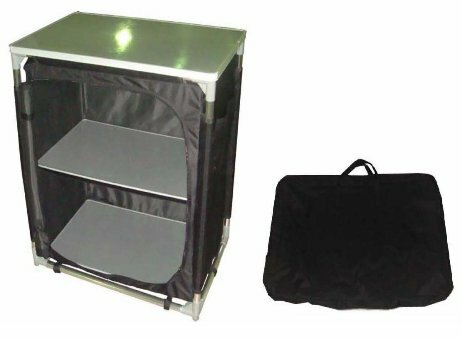 This practical two shelf camping cupboard not only provides ample space to keep your camping essentials well organized but can also double as a table surface. It requires no assembly and is up in a couple of minutes. It has a heavy duty (though lightweight) aluminum frame and is made of 600 D Polyester fabric. The shelves all have aluminum trims to make them sturdier. This camping storage has mesh ventilation for good air circulation. It’s a good place to store your non perishables away from insects and bugs. You also get a set of foodcovers. These food covers numbering three are made of collapsible mesh, thus occupy hardly any space and also protect your food. Available on amazon.com, it is yours for $79. 95. 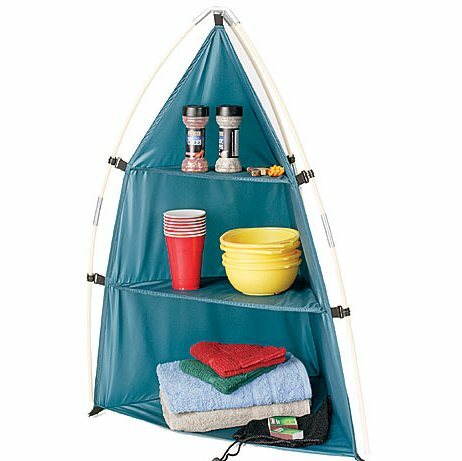 This unique color coded Modular Hauler system can be used to organize your dorm room, vehicle, closet, garage shelves and even your tent or cabin when outdoors. The color coded cubes help to organize and separate your stuff, with easy identification. It will help you keep dirty clothes separately or you may even use it to keep your stuff separate from the kids’ stuff. The hauler has open packing system giving easy access to the cubes. 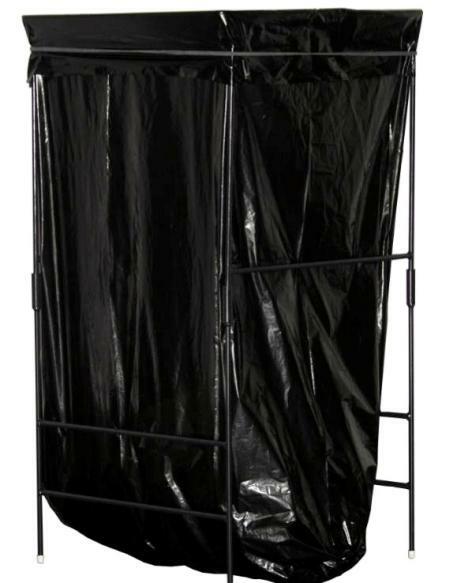 This type of camping storage has reinforced side access handles and padded haul handles. The cubes have a zippered top and cross panel webbing for stability. Available at mountainsmith.com for $59.00. A great tool to keep your food safe, the BearVault BV450 Solo food container is just the thing for people who like to go on camping trips alone for long period or for a couple who needs to be away for the weekend. Easy to open and very tough this translucent container has the rainproof lid and a snapping tab locking system and the lid can be screwed on/off easily. It is tough and durable. When the lid is completely shut you can even use this camping storage as a seat. It is advisable to store the can 100 yards away from the camp, preferably downwind and in shade. 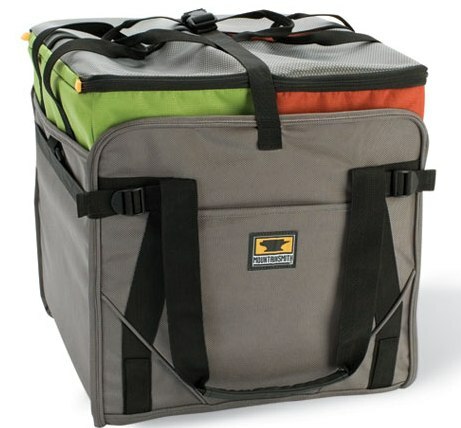 The Solo Food Container is available on rei.com for $66.95. The Rubbermaid Action Packer provides ample camping storage space for just about anything. 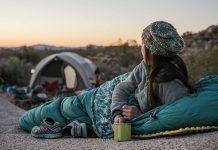 It can be used to store tools, holiday decorations, gardening tools, seasonal clothes or even as a store all during camping or trailing trips. 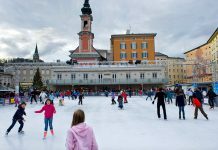 It is lightweight and made to weather any kind of condition. It will keep the stored stuff safe whether in a damp basement, a rough campsite or a construction site. The lid is secured with heavy duty latches that are lockable. 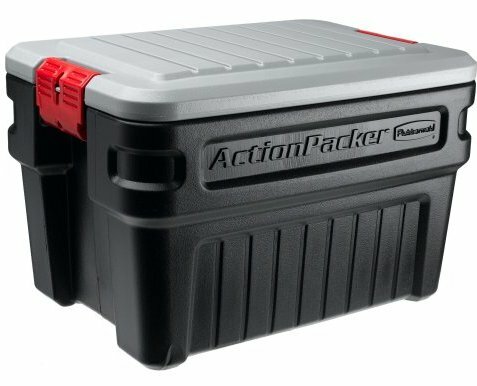 The Action Packer has a capacity of 24 gallons. The packer is water resistant, secure, portable, stackable and lightweight. Yours for $44.99, get it at amazon.com. 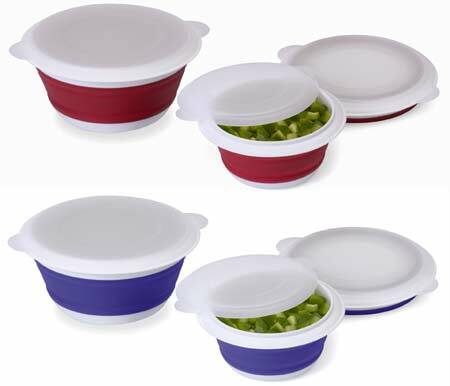 The perfect containers to carry and stored food when enjoying a camping/outdoor trip with family, Store Flat collapsible Bowls are really handy, flexible and yet sturdy as camping storage. 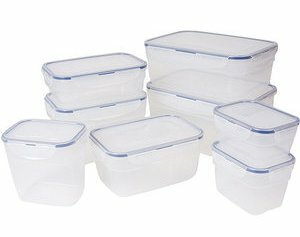 These containers can be used for storing and are dishwasher, microwave and freezer safe. Available as a set of three containers of different sizes they are space savers and can really help reorganize the camping storage during your camping trip. 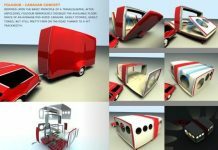 As they are collapsible when empty, they occupy minimum space and thus save valuable space whether indoors or outdoors. These multi-purpose containers can be used for school lunches, RV camping, Hiking, Kids, Traveling and even pets. This versatile set of three bowls is available for $15.95 on kidsmartliving.com. The CollapsibleTrash Receptacle from Trash Traveler is compact and lightweight. You can take it everywhere and anywhere. 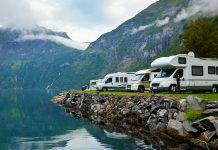 It is the perfect choice to keep your camping ground clean and tidy, especially as it takes only seconds to assemble or disassemble it. The Trash Receptacle can be placed on firm ground if the need be it can be anchored in soil. The frame is made of powder coated steel and can hold about 50lbs of weight. Use it as camping storage and also while trekking, hiking or even when working in the yard or garden. 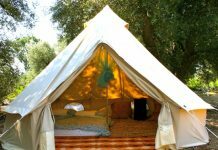 Available for $29.00 only at campingcomfortably.com. A good camping storage option, when you want to store foods like honey and peanut butter, which are not easy to handle. 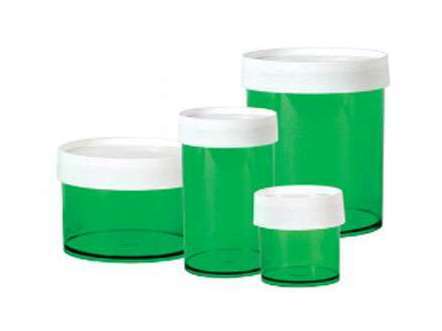 The Liberty Nalagene Jars come in different sizes to take care of your storage needs. The containers have straight sides with no lips or shoulders for easy dispensing. There is a little warning though for the 16 & 32 ounce jars may not be leak-proof. This is why it is recommended not to use them to store or carry liquids when traveling or camping. Available in two choices of materials, polypropylene or polycarbonate, you can order them on gearbuyer.com for $6.50 only. Lock and Lock brings to you a food camping storage set with 16 containers in varying sizes. These multi-purpose containers are perfect to organize your kitchen, carry food when traveling or store food when camping. The containers have a silicone gasket that makes them perfectly watertight, airtight and leakproof. They are also microwave and freezer safe. 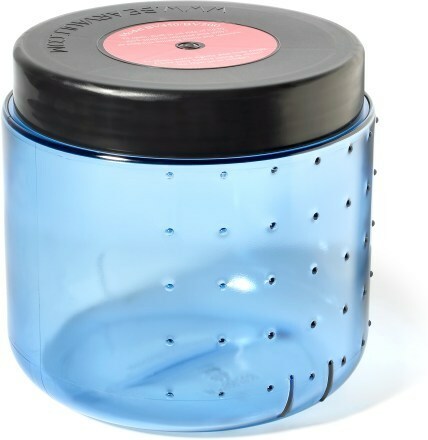 The containers are made of stain resistant plastic and are BPA free. These camping storage containers help you keep your food fresh and safe for longer. Available on walmart.com for $24.97.